David B. Coe writes epic fantasy under his real name and historical fantasy under the pseudonym D.B. Jackson. He was born in New York and has since lived in New England, California, Australia, and Appalachia. 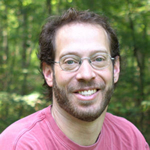 He did his undergraduate work at Brown University, worked for a time as a political consultant, went to Stanford University, where he earned a Master’s and Ph.D. in U.S. History, and finally returned to his first love: writing fiction. He received the William L. Crawford Memorial Fantasy Award for best new work in fantasy in 1999. He currently lives in Tennessee with his wife (a college professor) and their two daughters. Read sample chapters of his novels at David B Coe’s website or D.B. Jackson’s website. Recently I reviewed D.B. Jackson’s historical urban fantasy Thieftaker and Mr. Jackson was gracious enough to take the time to answer my questions about the novel. Here he offers up some insight into how Thieftaker came about, his research process, and the difficulties in writing Colonial Noir Fantasy. 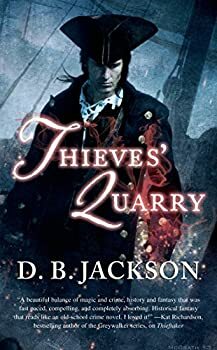 He also lets us in on a few of his plans for the future, including a sequel entitled Thieves’ Quarry. I’m looking forward to it! We’ve got five hardback copies of Thieftaker (with a gorgeous cover by artist Chris McGrath who, by the way, told us he enjoyed reading the novel) to give away to five commenters from the U.S. If you’d like to win a copy, leave a comment. The Thieftaker Chronicles — (2012-2015) Publisher: Boston, 1767: In D.B. 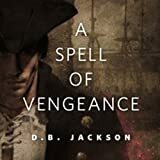 Jackson’s Thieftaker, revolution is brewing as the British Crown imposes increasingly onerous taxes on the colonies, and intrigue swirls around firebrands like Samuel Adams and the Sons of Liberty. But for Ethan Kaille, a thieftaker who makes his living by conjuring spells that help him solve crimes, politics is for others… until he is asked to recover a necklace worn by the murdered daughter of a prominent family. Suddenly, he faces another conjurer of enormous power, someone unknown, who is part of a conspiracy that reaches to the highest levels of power in the turbulent colony. His adversary has already killed — and not for his own gain, but in the service of his powerful masters, people for whom others are mere pawns in a game of politics and power. Ethan is in way over his head, and he knows it. Already a man with a dark past, he can ill afford to fail, lest his livelihood be forfeit. But he can’t stop now, for his magic has marked him, so he must fight the odds, even though he seems hopelessly overmatched, his doom seeming certain at the spectral hands of one he cannot even see. Thieftaker is an intriguing new book by D.B. Jackson (penname of David B. Coe) set in pre-Revolutionary Boston. While the novel has its flaws, its unusual setting, winning characterizations, and unique mix of historical fiction, mystery (with a real noir tinge) and fantasy mostly make up for relatively middling plotting and left me looking forward to spending more time in this world. Thieves’ Quarry is D.B. 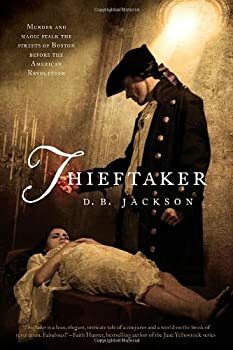 Jackson’s solid follow up to his first historical fantasy, Thieftaker, set in pre-Revolutionary (barely) Boston. In it, Jackson raises the stakes from the very start, beginning with a bit of a bang, as his protagonist Ethan Kaille is wakened one morning by an astonishingly powerful pulse of magic in the city. Ethan’s foreboding centered on that mysterious pulse is soon borne out as he is called in by the Crown to investigate the deaths of all the men, nearly a hundred, aboard an English war vessel floating in Boston Harbor, part of the fleet that brings an occupying force into the city in an attempt to quell the fractious colonists. Just last week while on vacation out west, my son and I were discussing what were the greater obstacles to our enjoyment of books and what elements allowed for those obstacles to be overcome. One of my observations was that while a strong plot will rarely overcome poor characters for me, if you give me good characters, I can overlook more than a few plot flaws. Who knew how prophetic that conversation would be? For upon my return home, I found waiting for me a copy of D.B. 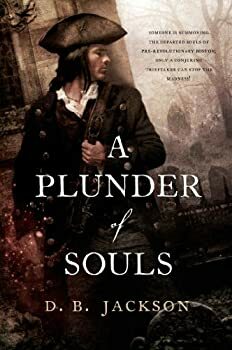 Jackson’s A Plunder of Souls, the third in his historical fantasy series set in pre-Revolutionary Boston. At the series’ center lies beleaguered thieftaker/conjurer Ethan Kaille, and it was Kaille’s still-engaging voice that managed to ease me past, if not blind me to, the several plot issues in the novel. Despite the series having some flaws, I’ve been a fan through the first three books of D.B. Jackson’s historical noir fantasy set in Pre-Revolutionary Boston and centered on the character of Ethan Kaille. 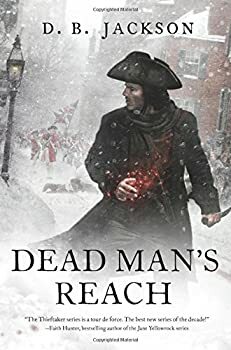 In the fourth installment, Dead Man’s Reach, Jackson turns in if not a perfect novel, perhaps the best in the series. One which would also serve as an excellent close to Ethan’s arc, though I for one hope Jackson finds it in himself to give us more of Ethan’s adventures.